Cocktail culture is booming. In cities like Seattle, New York, Miami, and every town and hamlet in between, cocktail bars are popping up everywhere. You might be surprised to know that it wasn’t always like this. It’s only been the last decade or so that the art of cocktailing has become this mainstream. It wasn’t very long ago that telling your friends you were a bartender mean that you weren’t really living up to your potential. Now, bartenders are the new celebrity chefs and the skill is gaining as much prestige and respect as its culinary cousins. With this influx of cocktail culture, came a unique problem. If you make amazing cocktails at your establishment or distillery, how do you get them out to people who might live hundred or thousands of miles away? The simple way is by bottling the mixture and selling it as is. But, what if your customers don’t want to open a whole bottle of pre-made Negroni or an Old Fashioned? What if they want to add them to a cooler with their favorite canned beer and wine or throw a few cans into a backpack for a day of hiking? Until recently that wasn’t possible, but following Australia and the UK numerous canned cocktail brands have emerged. Here are our picks for some of the best. How to prepare a Sparkling Caipirinha cocktail: Step 1: Open can. Step 2: Drink Sparkling Caipirinha cocktail. If you’re not yet on the caipirinha bandwagon, now’s your chance. Brazil’s national drink, the caipirinha consists of cachaça (a distilled spirit made from fermented sugarcane juice), lime, and sugar. 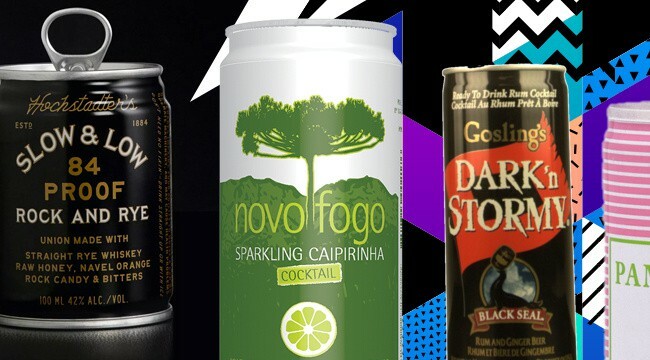 Thanks to the folks at Novo Fogo, you can buy this iconic cocktail in can form. It’s made with its silver cachaça, lime, and sugar. It’s 11.1 percent alcohol and gets an added kick from carbonation.